If you needed to, could you build a home to live in? Could you cook a whole, nutritious meal from scratch? Could you sew clothing for your family if department stores disappeared? If there was a local or national disaster, could your community feed itself and access clean water or are they dependent on other regions, as are most urban areas, for these very basics of life? If it was up to you to see to your own survival, how do think you'd make out? The truth for most of us is that we graduated from public high schools that let us walk out their doors with so few skills for actual human living, we'd last about a month if we found ourselves set down on a rural farm. Even if we studied textbook geometry, we'd be scratching our heads trying to apply this to putting a roof on a barn. Even if we studied chemistry, we might poison ourselves by improper testing of a well. And how bizarre is it that graduates from basic math courses spend their lives unable to balance a checkbook? But what if, when we were 12, we went to live with an uncle and aunt on a farm? Oh, there might be some nice books around if we wanted to read up on crop rotation, mixing milk paint or understanding weather patterns, but for the most part, we would spend our time working alongside the grownups as apprentices. We would care for the animals, sow and harvest the crops, and cook the meals. We would spend most of our time out in the sunshine, working on something real that taught us lessons about ourselves, human nature, and the planet on which we live. ""My vision of the future is no longer of people taking exams and proceeding on that verification from that secondary school to the university, but of individuals passing from one stage of independence to a higher [one], by means of their own activity, through their own effort or will, which constitutes the inner evolution of the individual." "Precious things are conveyed to the younger generation through personal contact with those who teach, not - or at least not in the main - through textbooks. It is this that primarily constitutes and preserves culture." In an Erdkinder program, the children live on a farm and their 'schooling' consists of running the farm as a business, including caring for the animals and tending the crops. Interspersed with these weighty tasks are academic studies based on real books and field trips. The goal of Erdkinder (German for Earth-Children) is to produce adults who are equipped with the confidence in themselves and actual skills to live in the real world. In older societies, peoples mark the passage into adulthood by various ceremonies. Inuit boys go on a vision quest. In other cultures, taking part in one's first game hunt marked the entry into adulthood. After this, the boy was considered a man by the culture and expected to assume all of the responsibilities of manhood. Most modern societies are now virtually without any meaningful markers of this kind. Instead, we have created something new called 'the teen years', where someone is not really a child but not yet an adult. Maria Montessori was astonished that during the time of physical, emotional, and intellectual turmoil called adolescence, most cultures immobilze children behind desks rather than let them put their energies into meaningful projects. It is little wonder, then, that so many young people, lost in this vague, enforced limbo, turn to drugs to distract themselves from the purposelessness of life, or become suddenly violent as do wild animals who are kept in cages. Human family systems are destroyed every day because someone refuses to be faithful to the family unit, to care for a sick family member, to care for a home, to care for children, to handle family money responsibly. Irresponsible people make life miserable for everybody, and I believe our current system of education, and the unthinking approval it has from the majority of society, is largely to blame for this. The Erdkinder method, by contrast, empowers adolescents with the knowledge that they must take responsibility for their own care and that their activities, pursuits and actions have a very real effect on their fellow students, instructors, home and community. Lessons about economics, environmental sciences, domestic arts are acquired through hands-on work and the intellect is developed by reading, by community discussion, by enriching interactions with art, music and nature. Hershey Montessori Farm School located in Huntsburg, Ohio offers one of the best-known adolescent programs in the United States. It is both a day school and a boarding school, serving some fifty students between the ages of 12-15. The school is housed on a large working farm, and the main house is designed to allow the students to run it alongside the adults. The students clean, cook, and learn to process and preserve farm-grown foods. Students are actively involved in the 'family' finances, working with a budget when they shop for the school's needs. The house is also the center of their social activities, a place to pursue art and to live alongside both their peers and the adult instructors who run the farm school. 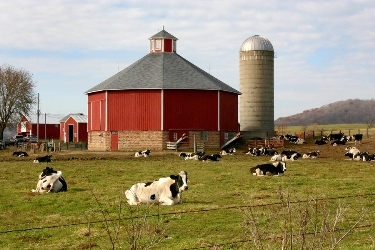 In addition to the main house, there are numerous barns and workshops on the property. Students care for the farm animals, learn handcrafts like woodworking, experiment with horticulture in an alternative energy laboratory and put on performing arts shows. Not only do the students make daily use of these facilities, they have also designed some of their own including a maple sugar house. The farm is surrounded by ninety acres of forest where the students hike, explore, swim and enjoy horseback riding. Beyond acting as stewards of the home, barns and land, the students run a bed & breakfast for the public. For any adolescent, this is an impressive skill set. What is most remarkable about the above list is that these subjects will not be vague, ultimately forgettable mental concepts. Children leaving the Hershey Montessori Farm School will have used these abilities to meet real challenges and better the quality of their own lives. These are accomplishments that will stick with them throughout adulthood. They can depend on themselves to create a life which honors their unique needs while at the same time honoring the needs of others. The most successful Erdkinder programs will most likely be extensions of already-existing, well established Montessori schools. This ensures that the necessary infrastructure is already in place. An existing school will provide the needed influx of students, as children already in Montessori move up to higher grades. These children will be well-equipped for Erdkinder, since they have a firm foundation in the Montessori method; their parents will be familiar with Montessori as well. In some cases, where schools are unable to provide an actual farm where children can live and work, modified Erdkinder programs are put in place. These include day and overnight field trips, student-directed studies, apprenticeships, long-term projects, student-run businesses, and an enriched program of academic studies focused on great literature and the humanities. While the 0-3, 3-6, and 6-12 age groups have always had a clearly outlined curriculum, Dr. Montessori left only general guidelines for Erdkinder. This lack of specifics has probably been one of the main reasons that Erdkinder has not been implemented in more Montessori programs. However, a quick search for "erdkinder" in any major search engine will return many helpful websites about Erdkinder in general, and existing Erdkinder programs specifically, indicating that many teachers and parents have already forged ahead to make Erdkinder a reality even without universal guidelines. I believe the time is ripe for the notion of Erdkinder. The implementation of the Montessori method, both in schools and homeschools, is on the rise. Parents who appreciate the results of Montessori for their children in the lower grades are desiring the same nurturing, respectful, child-centered environment for their children once they get older. My hope is that more and more Montessorians will see Erdkinder as a viable possibility for adolescents, and as Maria Montessori said, enable them to "pass from one stage of independence to a higher [one], by means of their own activity, through their own effort or will." To see if there's an Erdkinder program near you, just Google "erdkinder _____" and the name of your city, state, province, or country. You can also Google "montessori school _______", filling in your location, and then call schools in your area to find out about their programs.